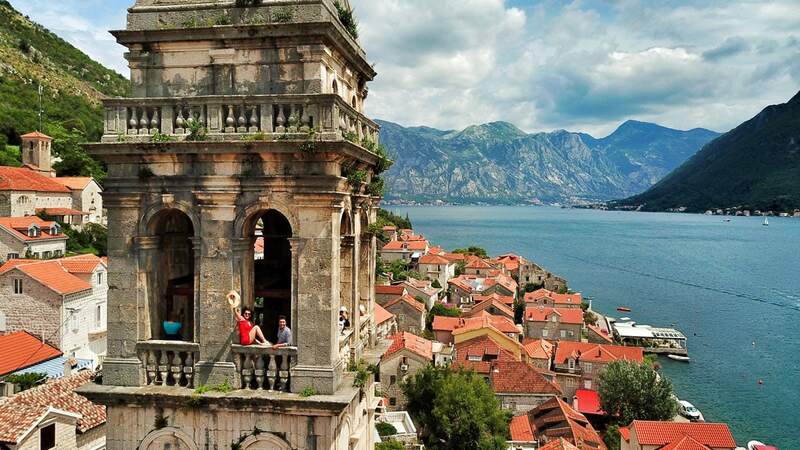 Located 15 minutes from the Kotor Old Town is the magical, medieval village of Perast, Montenegro. The old town is so charming, I felt I had to include as many photos as possible in this article on what to do in Perast to fully capture it. Words would be better used to write a fairy tale or epic poem based here, because it is the most enchanting place you will see. 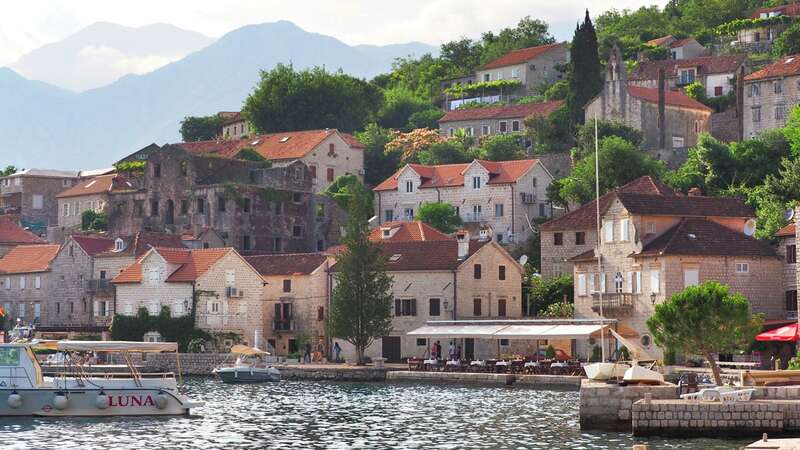 Chances are, if you’ve seen a postcard of Montenegro, it’s been of Perast. The village is known for its iconic silhouette of towering Venetian Gothic buildings. 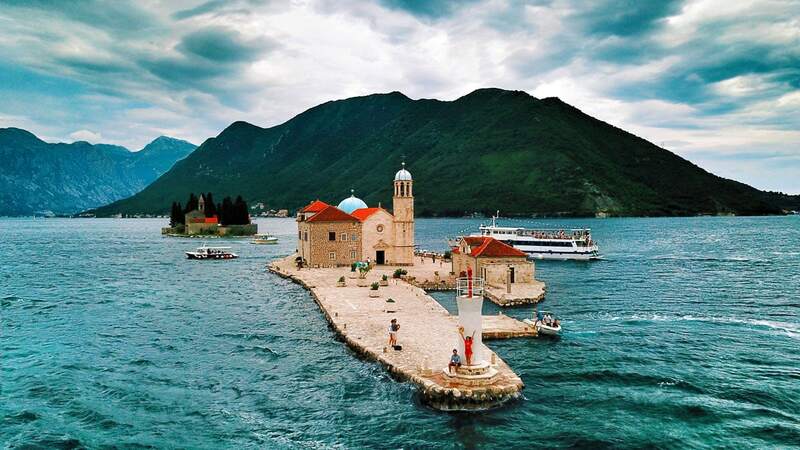 Photos of its historic stone buildings, seaside promenade and the 600-year-old Lady of the Rocks island are very frequently used in promoting Montenegro worldwide and is, of course, under UNESCO’s protection. Perast was established by the army to protect anyone trying to invade coming through the narrow strait across Kotor Bay. There were also two castles on each side of the strait. In this way, anyone trying to enter would be met with resistance from three points. Across from the town and just a few minutes away, there are two lovely islands – one natural and the other man-made. 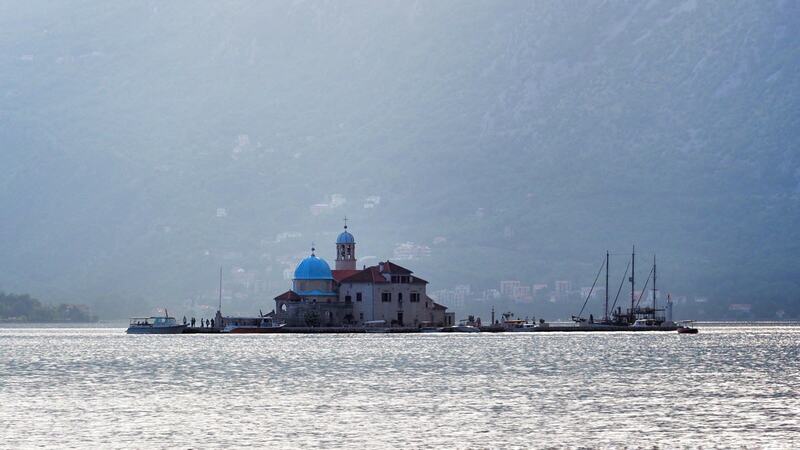 A monastery sits on St. George (Sveti Djordje) Island, which is closed to visitors. But you can see the facade of the stunning monastery and its bell tower without stepping on the island! The other island, Gospa od Škrpjela or “Our Lady of the Rocks,” has only a church, is open to tourists. We’ll go into its interesting story later on in the article. Perast is a small place where you can see everything in two hours. In 2 hours time, you’ll be able to go to Our Lady of the Rocks, walk around the historical center, and even sit down to eat something. But if you want to do more such as go into museums, check out the towers, or swim, then it’s better to set aside half a day. If you wander the streets of Perast without going into any museums or churches, then you’ll be able to see everything in 10 minutes. It is that small of a town. But, in fact, there are a total of 16 churches and 17 Venetian mansions tucked away in Perast’s alleys. Of course, some of them are dilapidated, but others have been restored and renovated. For this reason, we suggest you don’t limit yourself to the main road and square. Make sure to meander down the tiny streets and alleys! Sveti Nikola Church, or St. Nicholas Church, is a Catholic church that dates back to 1691 and is located in the main square of Perast. Its bell tower is 55 meters long. These bells, which were added to the church in 1713, were the biggest bells in Europe at its time. You can go up to the bell tower for €1. Going to the top is one of the best things to do in Perast, because you’ll have a wonderful overlook of the bay and two islands. Click here for the location. The church on the manmade island of Our Lady of the Rocks has been turned into a museum, and we think that it’s worth checking out. In 1452, a sailor returning from a trip discovered a picture of the Virgin Mary. The people of Perast turned this event into a totem. When a sailor came back from a successful voyage, he would throw a rock in the sea to get the Virgin’s blessing. As time went on, these stones piled up and became a small island. This tradition is somewhat alive even today. During the Festival of the Fasinada, which is held on July 22, boats pass by the spot and throw rocks into the sea. Old documents indicate that there was a church on the island as early as 1484, even if the building was hastily put up. In 1535, the church was blessed on behalf of the Virgin Mary. In 1579, it was named Our Lady of the Rocks. At one point, there were many sacred relics in the church, but pirates looted it in 1624. What we can see of the church and island today is from 1630, or almost 200 years after the icon was found. The church was severely damaged in 1667 by an earthquake, but it was then rebuilt. When you walk into the church, the first thing you’ll notice is the ornately decorated altar, done by Genoan Antonio Capellano and brought to the church in 1796. The icon that called for the creation of the island and the church is in the middle of the altar. There are also about 2,000 silver coins that adorn the walls of the church. Sailors and their families would leave silver coins at the church, in addition to throwing stones into the waters, when they made it back from a journey on the high seas. Inside the church, there’s a small museum that resembles a naval museum, with nearly 70 paintings of sea views, old marine instruments and 18th-century weapons. The church also displays a famous tapestry that was made by local artist Jacinta Kunić-Mijović. It took her 25 years to complete the masterpiece, all while waiting for her love to come home from a journey at sea. She wove gold and silver thread as well as her own hair into the tapestry, which measures 700 square cm and is one of the most detailed in the world. You can get to the island on a €5-boat ride. If you come here off-season, then you can ask a fisherman to take you across. IMPORTANT: Don’t think about coming to the island with nothing but a bathing suit – you will be told off. Bring a shawl to cover your legs and shoulders. Entrance to the museum is €1. Inside the museum, you’ll be able to get a guided tour for about €1 donation. The museum has archaeological finds from the city of Perast as well as sacred relics from the prehistoric age. There’s a small souvenir shop at the entrance of the museum-church. Click here for the location. As we mentioned above, you’ll only be able to see this island at a distance. It’s closed to visitors as there is an active monastery on the island. You’ll be able to see cypress trees in its garden and, underneath, there’s a small cemetery where notable people are buried. The city museum is housed in a mansion that belonged to Captain Visko Bujovic and dates back to the 17th century. In this museum, you’ll be able to see artifacts from not only Perast but also from Kotor Bay. Pro tip: There’s a lovely view of the city from the balcony on the second floor of the museum. 😉 Entry to the museum is around €2.5. Website. Click here for the location. 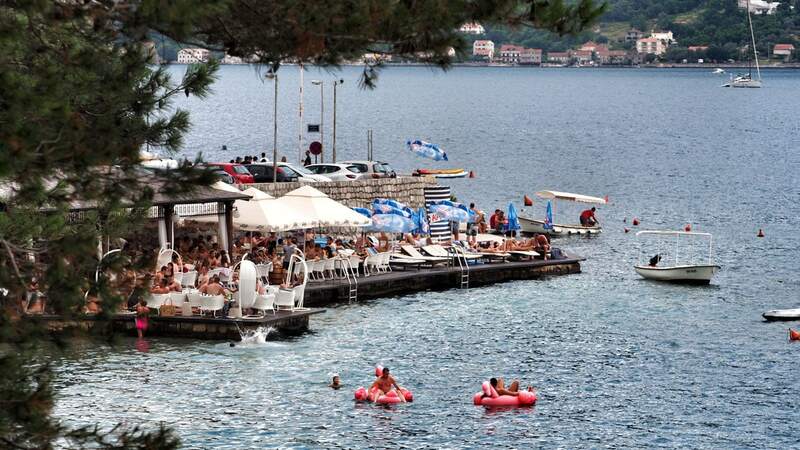 Pirates Beach Bar is a small pier located at the end of Perast. It’s a good option if you want to go swimming, as there’s no current or boat traffic. But we must warn you that it does get quite crowded. Click here for the location. If you have a car, then going to Bajova Kula – a five-minute drive – is a better option. We can easily say it is the nicest beach in the area. It also has its own restaurant and bar. Click here for the location. May 15: This is an annual festival to celebrate a victory over the Turks in 1654. They also have an interesting ritual where they chain a rooster to a float and set it out to sea. Then, they see who in the city can shoot the rooster. Of course, there are other traditions such as music and dance performances that you would see at any other festival. June 30-July 1: The Klap festival showcases traditional, chorus-like folk music from the Adriatic Sea coast. If you have not listened to this type of music before and happen to be here during the festival, then definitely check it out. July 22: The festival celebrates a tradition that is entirely unique to Perast. Every year, locals honor the Virgin Mary painting that was found and which led to the construction of Our Lady of the Rocks Island and its church. Locals will set out on the open sea and throw rocks into the waters around the base of the island. This ritual is both spiritual and logical, as throwing rocks helps to solidify the foundation of the island. This is Perast’s nicest restaurant. We recommend the Perast cake and almond sorbet. This is a central seaside restaurant that offers excellent fish dishes, other seafood and local cuisine. Address: Ul.Marka Martinovića bb Tel: +382 67 257 387 Click here for the location. This is the place we recommended above for swimming. It’s open 24 hours a day and has a swimming pool, sunbeds and showers. You’ll also be able to find snacks as well as alcoholic and non-alcoholic drinks and local dishes. Click here for the location. This is a traditional Montenegrin restaurant and is where the noble Bronza family used to reside. The restaurant offers a menu that fuses Mediterranean and traditional Montenegrin food. The decor inside the restaurant is reminiscent of seafarer culture during the Baroque period. Click here for the location. 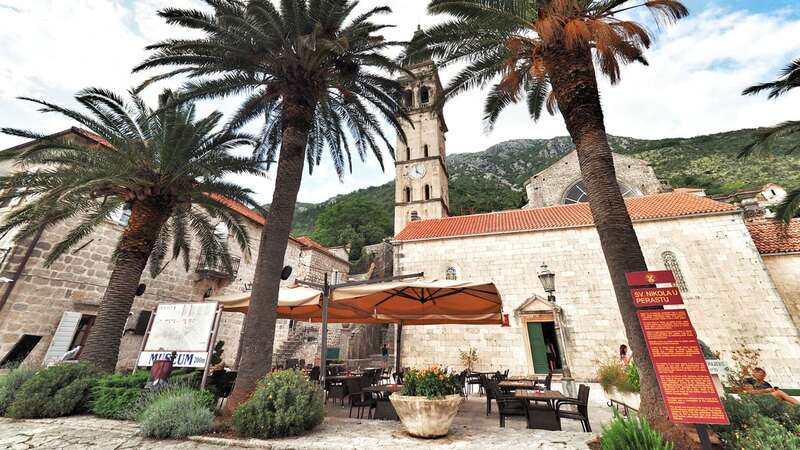 This restaurant has a central location in Perast on the coast. 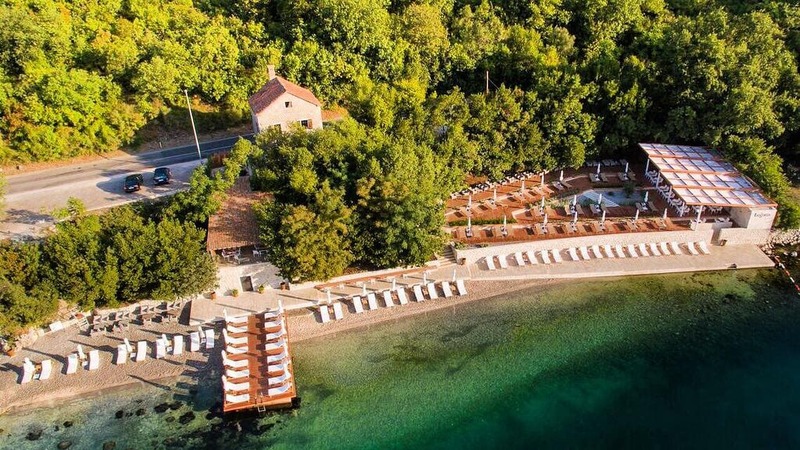 It’s also a hotel and offers a mix of Mediterranean and Montenegrin cuisine. Click here for that location. Perast is an excellent place for those of you who are looking for some peace and quiet. Old mansions and villas left over from Perast’s long-established wealthy Venetian families are now being run as hotels or rental apartments. We think that staying at one of these featured places is a great way to experience the area. The city is tiny and closed to cars, so no matter where you stay, you’ll be able to unwind. Conte Hotel is the old culture house of the city. It’s made up of a few historical palaces, but they are all very close together. The hotel has a restaurant that services both local and Mediterranean cuisine and has a view overlooking the two islands. If you’re with a lot of people, then you can rent out a villa with its own pool. Detailed information & reservation. This is a delightful stone villa that has mountain and sea views alongside its own pool and spa facilities. Detailed information & reservation. Monte Bay Retreat is one of Perast’s finest accommodation options with its outdoor pool and great quality of service. Detailed information & reservation. This is a fabulous option for a place in the center that is not far from the seaside. It boasts a spectacular view. Because it’s a house, you’ll be able to find everything you normally find in a house, such as a refrigerator, water heater and air conditioning. Detailed information & reservation. It’s a good idea to come to Perast via boat from the center of Kotor. You can get on a tour that lasts 1, 2 or 3 hours. 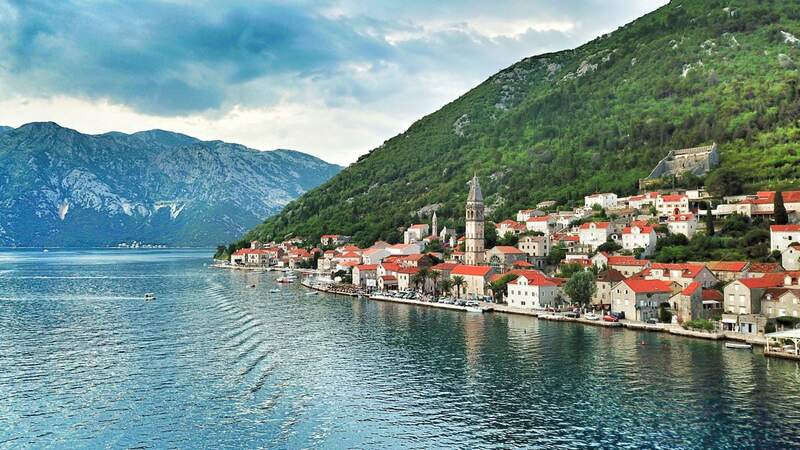 Along the way, you’ll be able to see other picturesque places in Kotor Bay. These tours depart from the harbor at Kotor Old Town. The 1-hour tour (€10/person) goes directly from Kotor to Perast and takes a 30-minute break at Our Lady of the Rocks Island. 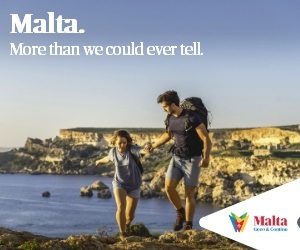 The 2-hour (€20/person) does the same but gives you the chance to go swimming. 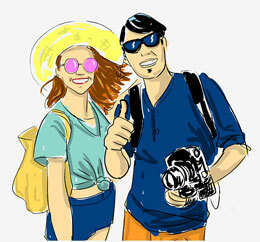 The 3-hour tour (€30/person) also goes to Mamula Island and Blue Cave. 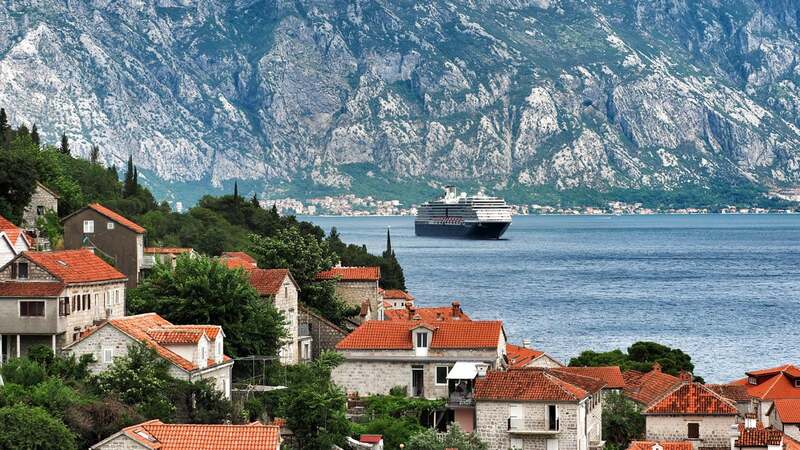 It only takes about 15 minutes from Kotor to Perast, making it very easy to get to by bus. The Blue Line buses take you from to Perast for only €1. You can pay on the bus with cash. The buses leave every half hour and run between 9:30 am – 10:30 pm. 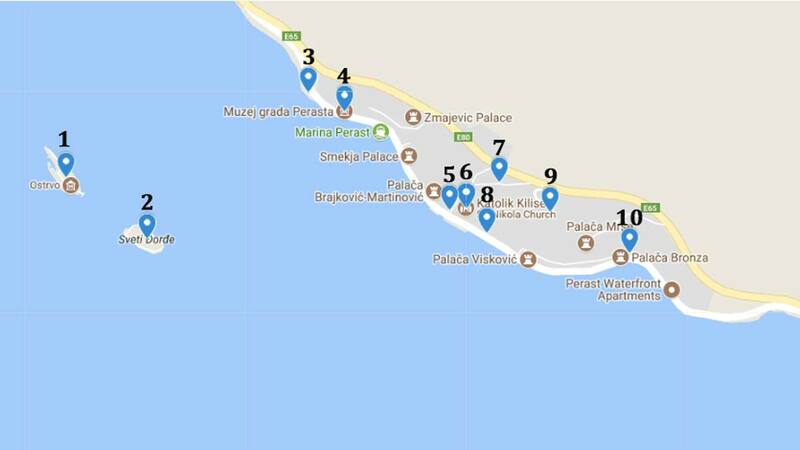 The return trip is the same way, and you can take the Blue Line buses opposite the place you got off in Perast. The city was controlled by the Venetians between 1420 and 1797. Perast was called Perasto in its Venetian dialect, which remained the official language until the 19th century. 140 of the people living in Perast speak Perasto amongst themselves or at home. The Baroque palaces and churches belonged to the wealthy families during Venetian rule – like Bujovic, Zmajević, Tripković, Smekja. This period is known as the golden age of Perast. Instead of city walls, 9 defense towers were built during the Venetian period. 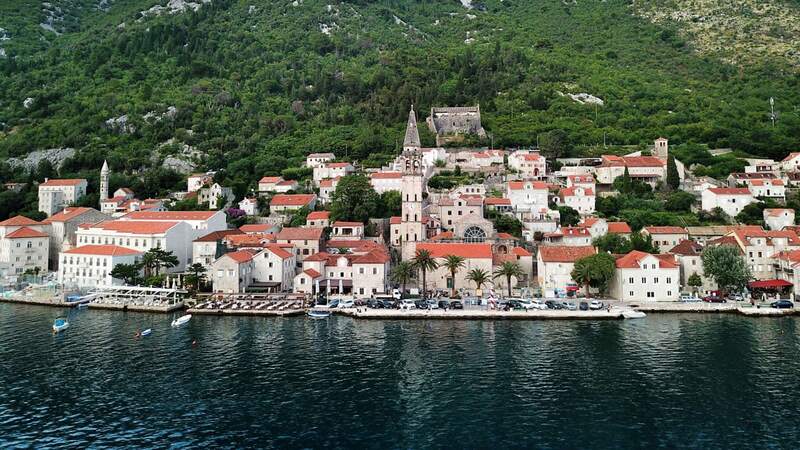 At the time, Perast had a fleet of 100 ships, a population of 1,643 and four ports. The people of Perast were quite skilled at shipbuilding and fishing. While the Venetians and Ottomans were fighting, the locals took their place in defending Kotor. 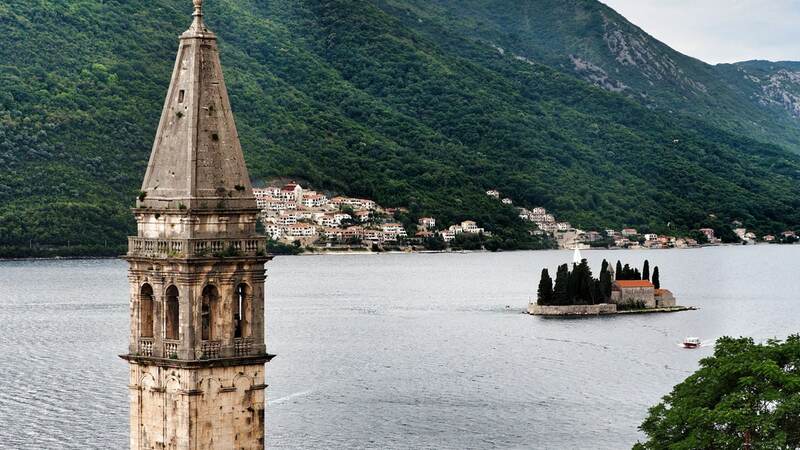 Perast was a significant part of the naval power of the Adriatic Sea and its surroundings for about 500 years. Sailors – first from the Venetians, then the Russians – came to Perast to learn about cartography, engineering and maritime education. The population of the city fell to 430 in 1910. The latest count shows that there are 146 Montenegrins, 101 Serbs, 29 Croats, 10 Yugoslavs, 3 Bosnians, 1 Macedonian and 59 people from other countries: 349 people in total. On 12 May 1797, the Republic of Venice collapsed, but Perast stayed faithful to Venice for a few more months. In the end, it was the last city of the Republic of Venice to surrender. On August 22, 1797, Count Giuseppe Viscovich, the captain of the Perast fleet, lowered the Venetian flag from the city. Between 1941 and 1943 – that is, during World War II – Mussolini reintroduced the area back into Italian territory. In 1945, Perast was part of Yugoslavia. After the disintegration of Yugoslavia, the territory belonged to Serbia-Montenegro, and then Montenegro. Montenegro declared its independence in 2006.